If you have not tried this on your tent ends you should ! to keep available heat in, according to the circumstances. Summer of 2001 is around the corner and the heat is coming. temperatures 1" from the top of the tent end inside the camper. Like to purchase The Space Blanket ? The thermometer was placed 1" from the tent end top on the inside of the camper. It was a very nice day with a air temperature of 73.3 degrees in the shade. But look at the temperature on the tent end. 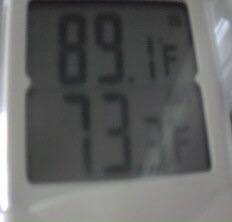 89.1 DEGREES !! 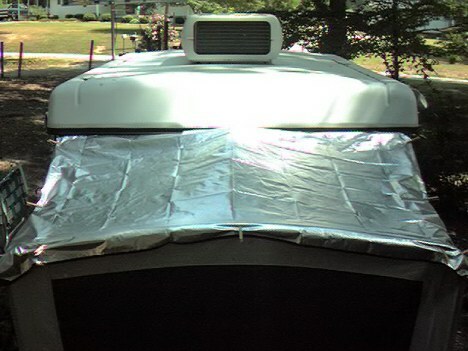 This was taken with out the mylar blanket installed on the tent end. Check back later when the temperatures rise and the difference of what this amazing blanket will do for you ! YOUR A/C WILL LOVE YOU !! The large plastic clips works better. Just finish a test and check out the temperature readings !! for a while and had to send it back for repairs. This test was made with the A/C running in the camper. CHECK BACK LATER FOR OTHER TEST ! !